Some of the most beautiful and memorable jewelry pieces are also some of the simplest. This lovely and feminine ring by Pomellato is a perfect example of the impact such a piece can have. Simple, tasteful and elegant, this rose gold ring is designed specifically to showcase its large and exceptional lemon quartz center stone encased in white gold. The rich, saturated yellow/green hue of the large faceted gemstone is complemented by the tone of the white gold in which it is set. 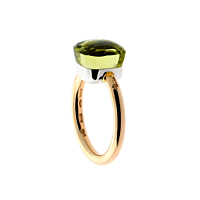 Create a look of utter elegance with this rare gemstone ring by Pomellato.